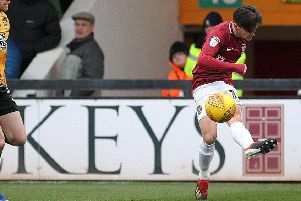 Cambridge United boss Colin Calderwood has admitted the Cobblers are ‘still very close to my heart’ ahead of this weekend’s crunch clash between the clubs at the Abbey Stadium. The Scotsman only took up the managerial reigns at Cambridge last month, but has had a positive impact on their fortunes. The U’s were in serious relegation danger when Calderwood was appointed, and although they are far from out of the woods yet, three wins from their past five fixtures has seen them rise to 20th and open up a five-point gap between themselves and the bottom two. Last Saturday’s 1-0 win at rock-bottom Notts County was a huge one and it followed on from a 2-0 home win over Stevenage. So Calderwood and his team are going for a third straight win against the Cobblers, knowing that a victory would take them to within one point of Keith Curle’s men. The 53-year-old is focused on doing just that of course, but he admits he will be upsetting some friends if he does sink Town this weekend - with some of those pals set to be at the game and sitting in the away end. “Obviously it was my first managerial job and I have very fond memories of the club from then,” said Calderwood, who was manager at Sixfields from October, 2003 to May, 2006, winning promotion from division three in his final season. “As I live in Northampton now they’re still very close to my heart in lots of ways. On the team news front, Liam O’Neil and Reggie Lambe won’t be fit to face the Cobblers, with the pair having also missed the win over Notts. Paul Lewis is expected to return to the match day squad.